I've been fine tuning this design over the past few years. Sometimes as a glass artist you achieve your vision on the first try and sometimes it takes twenty revisions to get there. I've been striving for just the perfect resemblance to marble. One of the longest parts of the glass blowing process is creating layers of color and pattern. As I am designing a new piece, color and pattern are my first considerations and often inspirations as well. Next I think about what type of form would display it best. Often times this includes drawing the pattern, even as organic as some may be, onto several shapes in my sketch book. I've been sketching long before I ever got my hands on glass and it is a very natural way for me to plan my ideas out. Choosing which glass colors to work with is a whole other can of worms. Each color behaves differently. Some have a viscosity that is softer than the clear glass and others stiffer. Glass color can be opaque, translucent or transparent and this must be taken into consideration with layering. The possibilities are endless but only years of experience and lots of learning along the way will make your ideas a reality. I'm very excited about my new quarterly newsletter called "Through the Looking Glass". It has been really fun to write and photograph for. Through the Looking Glass contains several segments including a featured item, a technical insight to glassblowing, a free glass giveaway, and a travel section. I like to feature one of my designs, discussing it's function, beauty and showcase it in a more natural setting. The "Tech Talk" section will explore different tools and processes in glassblowing educating my followers about the complexities of working in hot glass. Next, should you be a subscriber to the newsletter you are automatically entered into my glass raffle. Free glass! A winner is chosen at random and the item will be shipped to your home free of charge. If nothing else sign-up just for the chance to win! Occasionally I will promote a special sale item, and with the easy "click to order" button on the screen it will e-mail me directly requesting to set up a purchase. Last but not least, as I am known to be a traveling glassblower extraordinaire, I have a "Where in the World is Taryn Jayne" segment at the bottom of the newsletter. This is just a few photos and a small paragraph about a recent travel adventure. Again my newsletter is sent out to my subscribers quarterly and you can sign-up for it by visiting the contact page here on my website. Thanks again for following me and my work! Keep a look out for an upcoming video on the website. My incredibly talented uncle, Dion Scoppettuolo, is using glassblowing footage as a sample video for editing in his upcoming book. The book will be working with the editing program DaVinci Resolve. Since glassblowing is such a beautiful and alluring art form he decided to come to the glass hot shop and film some pieces being made. I will also be doing a short interview with some commonly asked questions. I'm so looking forward to seeing it finished! Here's a sneak peak of us in the shop! It is pumpkin season my friends! At the local markets I can barely keep these little guys in stock. 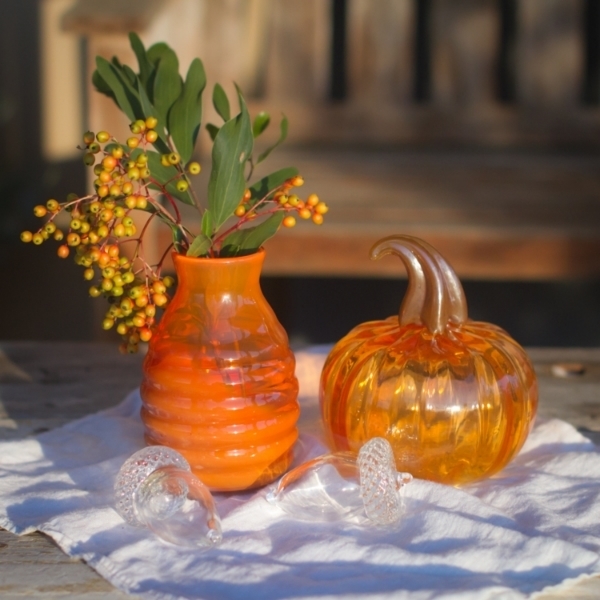 They are a great fall festive item to have around your house, on your porch and on that Thanksgiving table. Always a variety of colors, patterns and styles. Great way to keep fall vibrant! It can be bittersweet returning home from such amazing adventures at sea. With nearly unlimited creativity on stage, and with incredibly skilled teams, dreams do come true! I love finding inspiration from daily travel, natural patterns, and sometimes even creative and challenging suggestions. Inspired bottle with onion dome stopper. I am definitely more drawn to Scandinavian style glass. It tends to be on the thicker side, and really uses the weight of the clear to optimize glass's optic beauty. Tobias Møhl is a Danish glass artist and probably my favorite glass artist today. I encourage you to check out his work to understand what I am talking about. I spent most of my trip in Scandinavia and the Baltic countries. I very much love the culture and the design aesthetic. Helsinki, Finland was actually chosen as the World's Design Capital in 2012. Not everyone would want an amazingly orange glass fox in their living room but I could sure find a place for it somewhere! Whether you are a glass enthusiast or a complete glass nerd like myself, traveling the world and stumbling upon the brilliant and sometimes hideous glassy ideas of others is always exciting! Back at sea. Many adventures to come. As I mentioned in a previous posting I have had the pleasure to work for the Corning Museum of Glass on Celebrity Cruises. I like to refer to this as my "workcation". We work hard and play hard and I thoroughly enjoy it all. I am always so inspired by the many talented international friends I make and the glorious destinations we travel to. I am inspired by the big and the small- from the fjords in Norway to the ceramic tiles in Lisbon. I take in a healthy nature to city balance of new experiences always. This summer we will be traveling in the Mediterranean, the Baltic Sea and out to Iceland and Norway. Southampton, England is our home port and every 2 weeks we will return here to pick up new passengers and begin a new cruise. If you are curious about the itinerary and would like further details look up the Celebrity Eclipse. I will be returning to the United States at the end of August with some fresh new design ideas and ready to get back to work in San Diego. It's a rough life but someone has got to do it! Okay, by the title you might think this is a bad thing. On the contrary my friend. While I was working ever so diligently on my tan and traveling the world and blowing glass on the cruise ship this summer- My glassblowing partner Kathleen Mitchell was slaving away building herself her very own hot glass shop. So I showed up after all the hard work had been done to a beautiful new set up down in the Barrio Logan neighborhood of San Diego. If you are unfamiliar with the Glashaus you should check it out. This is a large studio building run by the fabulous metal artist Matt Devine. All together there are about 16 different studios and disciplines inside the building from metal to glass, ceramic, architecture, furniture design, painters and even a paleo dessert company. They frequently have works on display in their main gallery space so find them on Facebook for news and upcoming events. Here, Kathleen's private glassblowing studio known as Art-Hell rents its facilities to a few artists in the San Diego area. It primarily functions as a studio for her to make her art, as well as a place for her to teach classes and private lessons. If you are interested in a class or lesson contact her at kathleen@art-hell.com. I have been blowing glass in Art-Hell and it has been wonderful! Sometimes working in a new shop feels like cooking in someone else's kitchen. You know how to cook but you aren't used to their stove, or you don't know where they keep the pans. But as soon as I showed up to work in the studio I felt right at home! We work a few days a week creating the beautiful pieces of glass you see on display in my booth. Just a couple of girls making it all happen! If you think the Mediterranean is a scorcher in the summer time, you should try blowing glass in it! I had the privilege to work with several other talented glassblowers out at sea for three months. The Corning Museum of Glass has a hot glass show onboard Celebrity Cruises. Yes there is a glass hot shop on the top deck of the ship right next to the real grass lawn. Go ahead pinch yourself. This was my second contract blowing glass at sea and I absolutely love it! Getting to blow glass daily and try out new shapes and designs is a dream. We are entertainment on board and we have wonderfully engaging narrated demonstrations. It is not a hands-on glassblowing lesson with guests but it is very interactive with the crowd. 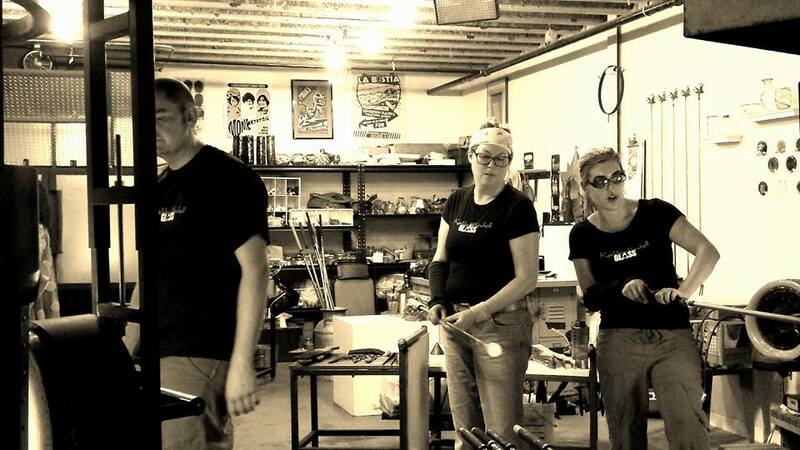 They get a chance to see a three glassblower team create works of art before their eyes and I find that each glassblower having their own unique style and approach to the medium really enhances the show. So that's where I have been for the summer. I know you all feel very sorry for me. The good news is that I created some really fun new designs and I'm very excited to get to work on them down here in San Diego! We are working hard as a team to make a glass birthday cake! Glass can be a very wasteful art form and so it is important to me to try and reuse all that I can in creative ways. If nothing else it helps to give me a personal challenge in my designs as well! So I began to make a series of cups with recycled glass bottoms. I've come to realize that people really prefer being able to see what it is that they are drinking, but your glass still needs some pizazz! So I have taken what would otherwise be glass waste and remelted it for a colorful, one of a kind cup! Since each little recycled patterned patty is a different size- so aren't the cups! They are great to mix and match- no two are alike! Here's a peek at some of the recent button vases I've made. I got home, started to unwrap them, and set them aside carefully. Then I noticed that they were creating these really beautiful shadows, so I had to snap a quick picture!